Good quality cheap golf equipment is available online, at large retail outlets and through some manufacturers who sell pre-owned clubs. Taking up golf isn't cheap. In addition to fees at golf courses and driving ranges, purchasing equipment can be costly. Golf clubs, tees, bags, shoes and balls can add up to hundreds or even thousands of dollars. Fortunately, for those on a budget there are ways to secure discounted or inexpensive equipment. There are a number of online classified sites that specialize in selling used goods and surplus items at discounted prices. Among these items is golf equipment, everything from clubs to bags and balls. Scour online classified sites, which can be tailored to nearby areas, for a detailed list of available items. Craigslist, Oodle and Yahoo Classifieds are some of the many online classified sites users can search for golf equipment. Another surefire way to track down used--and therefore, discounted--golf equipment is through neighborhood garage and surplus sales. These sales, many of which are promoted in community newspapers, neighborhood newsletters and neighborhood signage, often feature used goods at bargain-basement prices since most sellers are looking to clear out these goods from their homes. Items can include golf equipment, notably clubs and bags. One of the foremost producers of golf equipment in the world, Callaway, is now in the game of selling pre-owned, refurbished equipment at discounted prices. 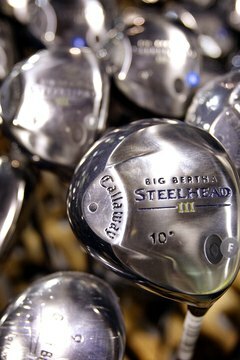 For example, as of July 2010 the Callaway pre-owned website featured any 6-iron available for only $10. Other items for sale at discount rates include putters, drivers, head covers, gloves, grips, balls, shoes and headwear. After purchasing new golf equipment, players can look to dispose of their older equipment through Goodwill Industries, which accepts donations and offers receipts for tax purposes. Visit any area Goodwill to check on the availability of pre-owned, discounted equipment. A visit to most any golf course pro shop can yield a section devoted to used equipment for sale at inexpensive prices. Popular discounted items sold at pro shops include clubs and balls, many of which have been used previously. Contact golf course pro shops in nearby areas to check the availability of used or discounted equipment. What Equipment Do You Need for Golfing?